Italy. Kingdom of Sicily. 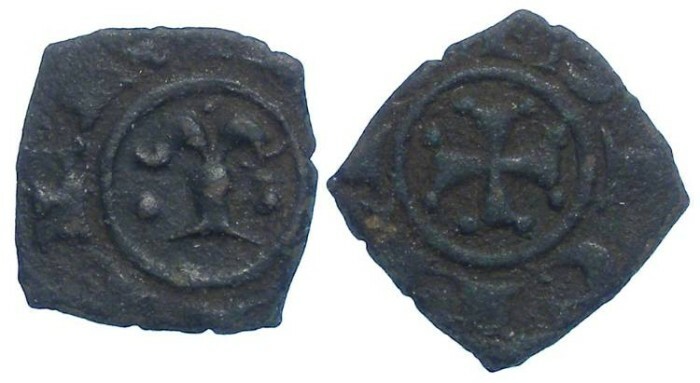 Manfred von Hohenstaufen, 1258-1266. Billon Denaro. Denomination : Billon (probably more bronze) Denaro. Mint : Messina. Reference : MEC 14, 614. Size : 13.5 x 16.1 mm. Weight : 0.95 grams (heavy for these). Grade : gVF with a dark green patina, on a squarel flan. Some deposits and probably could be improved with proper cleaning. The inscriptions are only fragmentary, but it is doubtfull this type exists will full inscriptions. Obverse : M (for Manred) with MAYNFRI around. Reverse : Short cross with dots in the angles, with SICILIE around.